Place red and sweet potatoes in large saucepan; add enough water to cover. Bring to a boil. Reduce heat; cover and simmer 20 to 25 minutes or until potatoes are tender. Meanwhile, heat kielbasa in medium nonstick skillet over medium heat for 5 minutes or until browned, stirring and turning slices frequently. In small bowl, combine water and flour; mix well. Add flour mixture, onions, sugar, vinegar, salt and pepper to kielbasa in skillet; stir to mix well. Bring to a boil. Cook 1 minute, stirring occasionally. Peel potatoes; cut into cubes. Place in medium bowl. 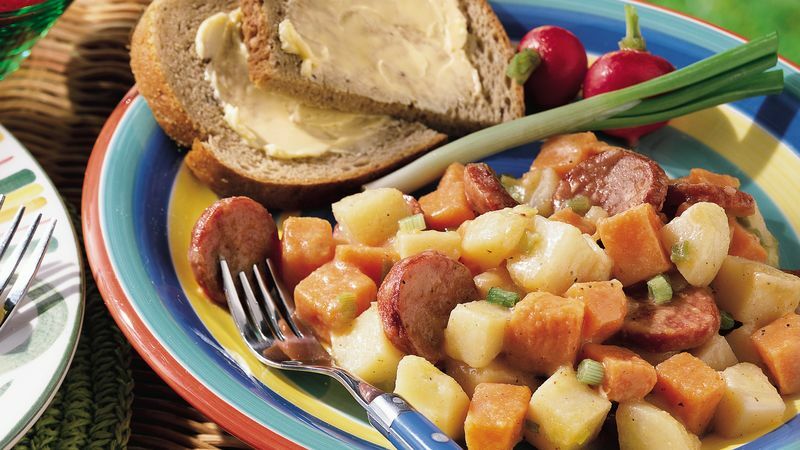 Pour kielbasa mixture over potatoes; mix well. One variety of sweet potato is pale, dry and mild and the other is deep orange, moist and sweet. For the best flavor and color, use orange-fleshed sweet potatoes. Depending on size, the red and sweet potatoes may need different cooking times. Check them after 15 minutes. Remove the potatoes that are done, and continue cooking the remaining potatoes. Prepare the potatoes, cover and refrigerate them for up to one day. Warm the potatoes in the microwave before continuing with the recipe.